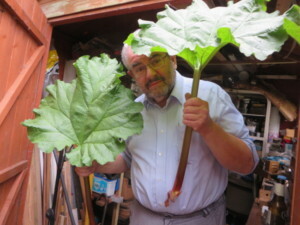 Yesterday I plucked two Rhubarb stalks from my little Rhubarb plant. Any ideas for cooking it without the use of oodles of sugar would be most welcome please. Anne … 12th May 2018. Nice one Jane but what else can I do with them!!! Love the photo of Dom. You can use sweet cicely to sweeten rhubarb but I don’t know what quantity. I have that in full flower at the moment,and it has spread and coming up elsewhere …yippee! Thanks Cilla. That’s what we’re are all here for to help you are not dumb, just preoccupied.